RG3! RG3! RG3! MVP! MVP! MVP! Those were the chants that rang out of Redskins Park as Robert Griffin III walked to the practice field. In case you didn't know, RG3 hasn't taken 1 NFL snap yet. But that is the mindset of fans in a city where the most hopeful part of each season is in the offseason. The fans watched and cheered every time Griffin touched the ball, and there was a sense of hope in the mood at Redskins Park. When RG3 moved from one end of the field to the other for different stages of practice the crowds shifted along with him. The end of practice was a scene out old Beatles clips. 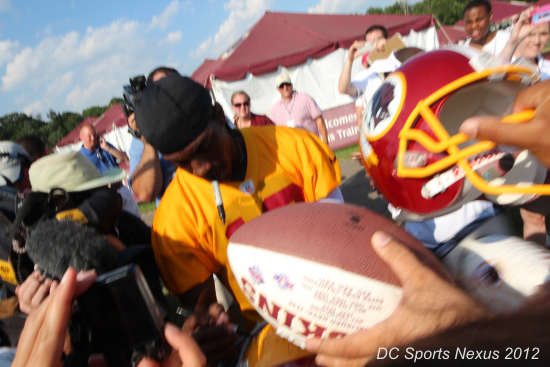 The fans saw RG3 headed over to sign autographs and they flipped out. People ran towards the quarterback, trying to run through the fence that separated the players from the fans. Lawn chairs, coolers, and small children were trampled as fans begged and screamed for the rookie quarterback to sign their memorabilia. Only about 30 or so lucky fans ended up with an autograph. RG3 didn't spend much time with fans but the way he went away from the crowd, then back to a new section of the crowd, made it seem like he did.